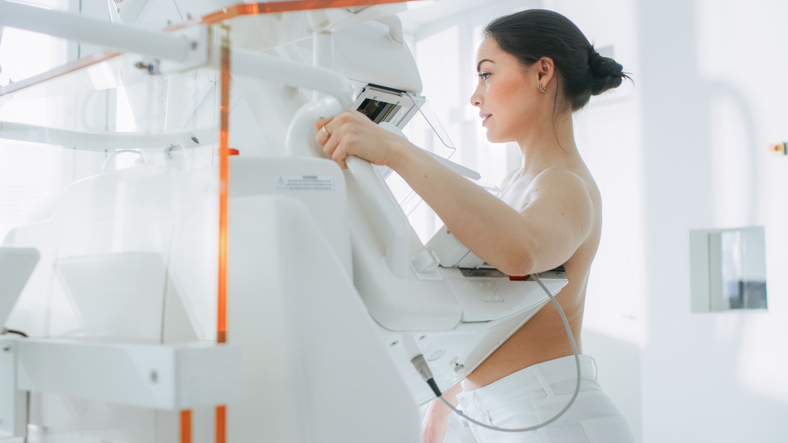 The actual mammogram exam isn't as scary as most people think. What Is The Experience Like During A Mammogram? The day you arrive for your mammogram, you may feel a bit nervous. You don't need to be. The entire process can be a simple and easy one to do in a relatively short amount of time. As part of the exam, you will need to remove any jewelry that might interfere with the X-ray picture, especially from your neck and chest area, and any rings on your fingers in case you will need to use your hands in helping position your breasts. You will be asked to take your clothes off above the waist, and you will be given a gown to cover and use to partially disrobe during the test. If you are concerned about a specific area of your breast, show the technologist so that the area can be noted. And again, tell your health care provider and the radiologist if you are pregnant or breastfeeding, have breast implants and/or have had a biopsy. Give the radiologist all previous mammograms for comparison if youâ€™ve brought them, even if they were performed in other medical centers. Or make sure they know where they can be obtained for comparison. If you have any area of concern, or have had a previous area of concern, a small x-ray marker may be taped on the breast overlying that area. This will help in determining whether any other special mammogram views need to be done beyond the standard views. 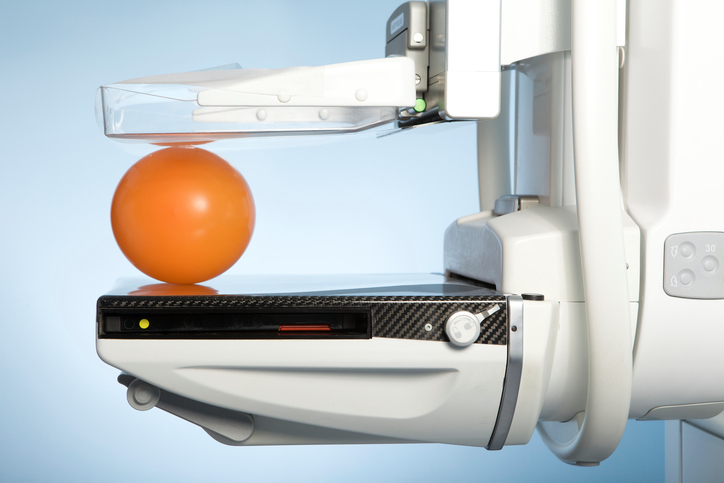 The mammogram imaging is quick and easy and takes only a few seconds. At the start of the exam, the patient's breasts are positioned on a firm flat panel of a mammography machine set at a comfortable height. You usually stand during a mammogram; sometimes you may also be asked sit or lie down, depending upon the type of X-ray equipment used. Sometimes the panels you place your breasts on will feel cold. This does not affect anything other than your individual comfort. The technologist will then apply a firm but gentle pressure, flattening the breast slightly with another panel above. This results in compression of the breast between the two panels. This compression may cause a degree of discomfort but should only last for a few seconds. Many want to know if this compression really necessary? Breast compression is done so that the breast thickness is evened out so all of the tissue can be visualized. It is also done to spread out the tissue so that smaller abnormalities are less likely to be obscured by overlying breast tissue. 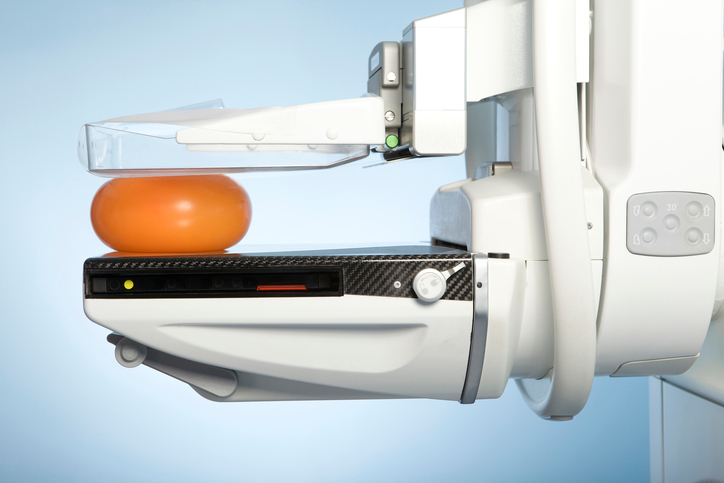 Pressing the breasts for a few seconds actually helps minimize the necessary x-ray dose as they can travel through a thinner obstruction to the film behind and reduces the x-ray scatter to make the picture even sharper. And like a regular photograph, the less motion during the taking of the shot, the less blurr in the final image. At this point, you may be asked to lift your arm or use your hand to hold your other breast out of the way. The technologist will walk behind a wall or into the next room to activate the x-ray machine. From there, you will be asked to hold your breath for a few seconds while the X-ray picture is being taken. Again, the less motion the sharper the image. But the shot itself only takes a few seconds. Generally, two x-rays are obtained of each breast. More views may be obtained if the breasts are large, the woman has had a breast augmentation, or there is an area on the initial mammography views that needs to be further examined. You will be asked to change positions between images and repeat the same procedures. In screening mammography, often both head-to-foot views (craniocaudal, CC) and angled side-views (mediolateral oblique, MLO) of the breast are taken. 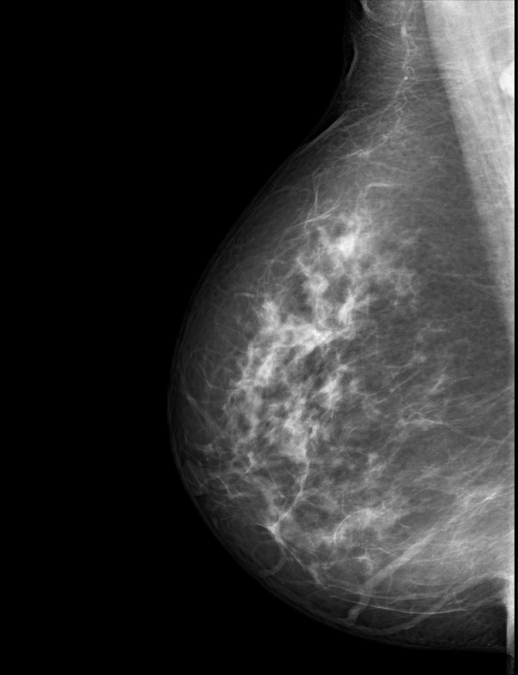 Diagnostic mammography may include these as well as some other views, specifically of the area of concern. Find out what the experience is like and what you should expect. ABOVE: It's easy to make out the shape of the breast in this side view mammogram. 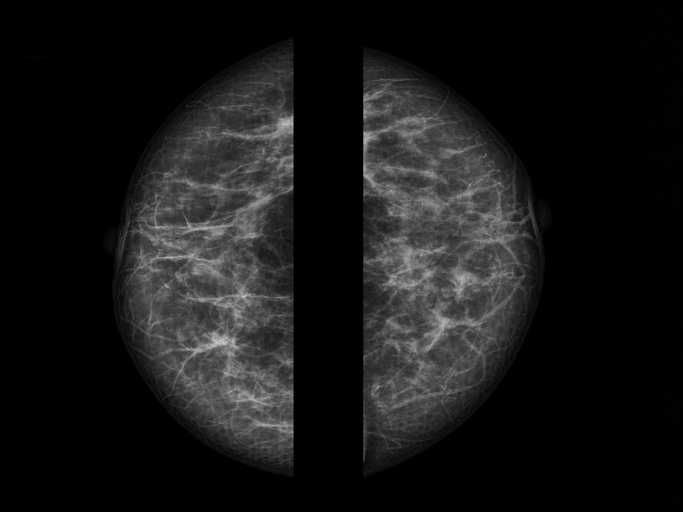 ABOVE: A top down mammogram view taken of both the right and left breast. ABOVE: A side view mammogram can be seen here of both the right and left breast. The top section shows the arm and underarm of the patient. Â© 2009-2018 Two Views. All rights reserved. Two-ViewsÂ® is for informational purposes and should NOT be considered medical advice, diagnosis or treatment recommendations.